Dr Tedros gave an overview of the work of the WHO in 2018 including the writing of the WHO thirteenth general programme of work 2019–2023. He said the programme of work was a precondition for the WHO investment case so was prepared as soon as possible. He noted that the programme of work focused on primary health care and the importance of health promotion, prevention, early diagnosis, and treatment. The Group of 20 countries meeting last week in Buenos Aires invited the WHO for the second time, Dr Tedros said, underlining his satisfaction that the G20 communique included major global health issues, such as antimicrobial resistance, the International Health Regulations, non-communicable diseases, and nutrition. Other focuses of the year 2018 included preparedness, and emergencies, Dr Tedros said. He remarked on the two Ebola outbreaks: One which started in May in the Democratic Republic of Congo, and was under control in July, and another one which started in North Kivu, a province of the Democratic Republic of Congo, which is still ongoing. Fighting Ebola in North Kivu is more complicated, he said, because of active conflicts, and more than 60 armed groups, a high population density and a high concentration of displaced people. Although not under control, the number of cases in the current Ebola outbreak has been kept low by very active vaccination, Dr Tedros said. Some 39,000 people have already been vaccinated, he said, soon to reach 40,000. Preparations are ongoing in neighbouring countries, such as Rwanda, where health professionals are being vaccinated, he said. He underlined the importance of security for health personnel and said the United Nations Peace Force was now helping protecting those personnel. Answering about the recent news about the Chinese researcher gene-editing twin babies so they can be immune to HIV/AIDS, Dr Tedros said the issue of gene editing is serious. It cannot be done without clear guidelines and standards that cover all ethical, social, and safety issues, he said. He mentioned that the Chinese government closed the project and immediately launched an investigation. Gene editing “may have unintended consequences so this is uncharted water and it has to be taken seriously,” he said. Intellectual Property Watch, which recently covered the discussions of the Conference of the Parties of the Convention on Biological Diversity, asked about a project called Target Malaria, which plans to exterminate malaria-carrying mosquitoes to eliminate malaria in African countries (IPW, Biodiversity/Genetic Resources/Biotech, 23 November 2018). “We should not go to gene editing without understating the unintended consequences,” Dr Tedros said. “We have to understand that first.” Malaria is a serious disease and there were 260 million cases in 2017, he remarked. It kills close to half a million people a year – every minute one person dies because of malaria, he said. On malaria, “we have the classic methods,” he said, such as vector control, larvae control, and early diagnosis and treatment. “We have many tools at hand. The problem is we are not using the tools at hand to the maximum,” he said. “Many countries which have eradicated malaria has less tools than we have now,” he said, adding “it is not a tool issue,” and said he was speaking as a malaria expert. The CBD agreed on a precautionary approach to synthetic biology, including gene editing, last week (IPW, Biodiversity/Genetic Resources/Biotech, 29 November 2018). Asked about WHO activities on affordability of medicines, Dr Tedros said that in low- and middle-income countries, some 90 percent of people pay out of pocket for their medicines. Access to medicines and in particular affordability together with quality are very important for the WHO, he said. There was a high-level panel by the United Nations Secretary General that gave recommendations to the WHO two years ago, he said, and “we are trying to push for that, ” he said. He added that member states could help the WHO to implement those recommendations, and announced that a conference on medicine pricing will be organised in 2019 in South Africa. The event is being planned for 11-13 April, according to sources. So at the same time WHO is engaging with private sector directly, he said. 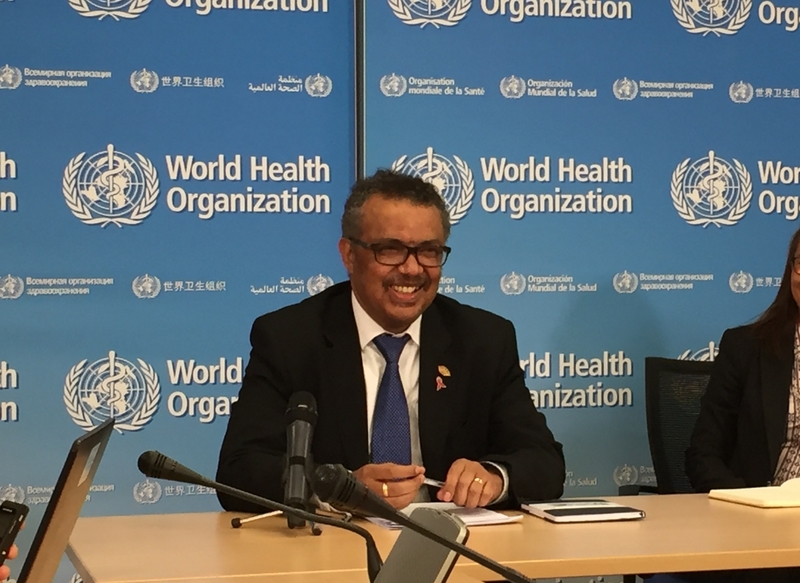 "WHO Director Tedros Gives Thoughts On Access To Medicines, Gene Editing, Ebola" by Intellectual Property Watch is licensed under a Creative Commons Attribution-NonCommercial-ShareAlike 4.0 International License.